When people are away from home they need a solution to call their friends or family on a cheap rate, because mobile roaming is an expensive thing. You can now setup a phone service for them so they can make cheap international phone calls. Any type of broadband internet connection is enough to handle your voice traffic. The minimum requirement is 256/128 kbit/sec. You can offer the service on any type of analog phone with tone dialing. You also need a SIP gateway or adapter (for example Linksys PAP2) which will route the calls via internet to our call exchange servers. The cost of this entry investment is about $70. You need to register an account so you can add your location and setup an account for your SIP device. You can also manage and print your calling cards, ratesheets, etc. there. Currently the phone service is for Hotspot Operators. If you don't want to operate a hotspot, just use the phone service, please go to SIPcontrol.com and register there. TIP: If you don't have a place to put out a phone, your customers can use any SIP phone, desktop or mobile SIP software applicaton. In this case you don't need a SIP gateway because everything is built in to the SIP phone. They just have to enter 'sip.hotspotsystem.com' as the SIP server address, the username and password is printed on the calling card which they receive from you. Our servers will route the calls and will count each call's cost. Your client will be informed about the remaining balance on the phone. Our system can handle calls to almost any country in the world. Each route has it's own provider and system. You don't have to deal with this, we manage and pay all routes. It's your responsibility to provide the service in places where most people need a phone service. You also have to sell the printed calling cards. The equipment must be set up by you. You'll need a regular phone, a SIP gateway (for example Linksys PAP2), and internet connection. This hardware costs about $70. Alternatively you can tell your users to use their own SIP software (on their phone or on their computer). You sell the card, we provide the call and the prepaid system. We share the income so you get 50% and we get 50%. 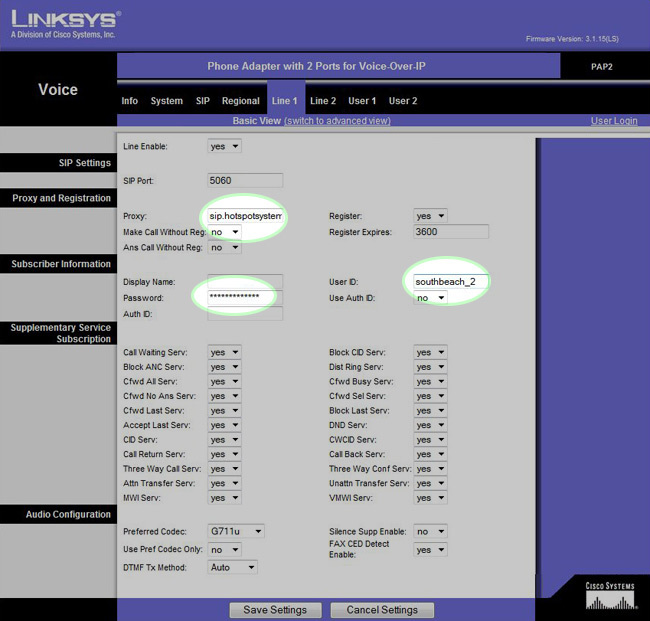 In the Control Center you can easily add SIP devices, create your own Calling Cards Plans (for example if you want to sell a card worth 10 USD you can do that).Additionally you can create a customized ratesheet where you can add different routes so your users will know how much a call will cost if they call a landline in Australia for example. After you defined what cards you would like to sell, you can then buy these cards from us, print them for your customers and sell them for cash. On the phone the client will hear a welcome message which asks the client to dial a secret PIN code. Upon successful authentication the line is open for the user. Upon successful authentication the user can dial the required number in international format. During the call the system counts and deducts the actual calling cost from the client's balance. It's calculated from the actual calling rate. The client can here the balance too on the phone. You can check the actual prices of calls to different routers here. You can use any touch tone phone with SIP internet gateway or you can use SIP phone too. The phone has to autodial 9999 to enter the calling card system. Basically you have to set three values on your SIP device: SIP server,SIP username, SIP password. You can find these values on the controlcenter under Calling Cards > Sip devices if you don't have any device yet, simply add your first SIP location. 1. How to setup and connect to your PAP2. - Before powering the device on, first you need to connect its Ethernet port to the internet. - Then connect your phone to the line1 port on the PAP2 device. Plug the power cable in and wait 60 seconds. - Pick up the phone, and dial the star key 4 times. You will hear a message stating you are in the configuration menu. Enter 1 1 0 and press the pound key (#). - You will hear a human voice give you your device's IP address. - By default PAP2 does not have a password set. You will now be in the administrator interface. Open your SIP gateway's administration page and click on admin login, choose line 1. 2. Set sip.hotspotsystem.com in the SIP proxy (or SIP server) field. Enter your SIP user ID, and password you created in the control center (which is different from your controlcenter login and password). This way the device will autodial 9999 so the user will not have to dial this, the user will hear the welcome prompt after picking up the receiver. 5. Don't forget to Save Settings on each pages. A: You can set up your own virtual phone service. You can simply install the necessary device and you can sell your own prepaid phone cards. You can keep the 50% of the income by default. Q: I registered but how to buy credit? A:Log into the control center choose the amount of cards and buy the cards online. After this you can print out the cards. Q: Can i sell calling cards in my local currency? A:Yes, you can set your currency on the control center. Q: Do you have better long distance rates that are much less compared to our regular telephone providers? A:You cannot earn money over your regular telephone providers service. Our rates contains your and our profits as well, that is why the rates are more expensive. Q: Can i sell minutes for cheaper rates? A:It's possible to set cheaper rates for your users but this way your earning will be less. Q: Can you explain if i buy calling cards worth of $10, how do we share the revenue? A:When you sell the prepaid card for $10 you can keep $5 because you paid just $5 for the card. Q: Can you provide a local inbound number? A:Yes, it's possible to assign local number to the service. Please send us your area code so we can give you a quote. Q: What are the internet upload/download requirements? A:128kbit/sec up and 128kbit/sec down. Make sure the line is not overloaded with other data traffic and make sure to set voip QoS on your router if possible. Q: How many simultaneous connections does the system support? A:There is no limit. We are continously extending our system as demand grows. Q: Can users use a VOIP software to make phone calls? A:Yes, the user can use voip software with internet connection. The username and password for authentication can be found on the card. Q: Can users check the numbers they dialed, length and costs of their calls and actual balance? A:Yes, you can find the login link for users on the control center.